The Outdoor curriculum plays an important part in the South Devon Steiner schools ethos. It allows the children to understand and appreciate the natural cycles of the year, learn to respect and revere nature, work as part of a team, develop their tolerance of each other, learn traditional skills that have been carried out in this country for generations and of course to have some fun. Animal husbandry forms part of the curriculum. 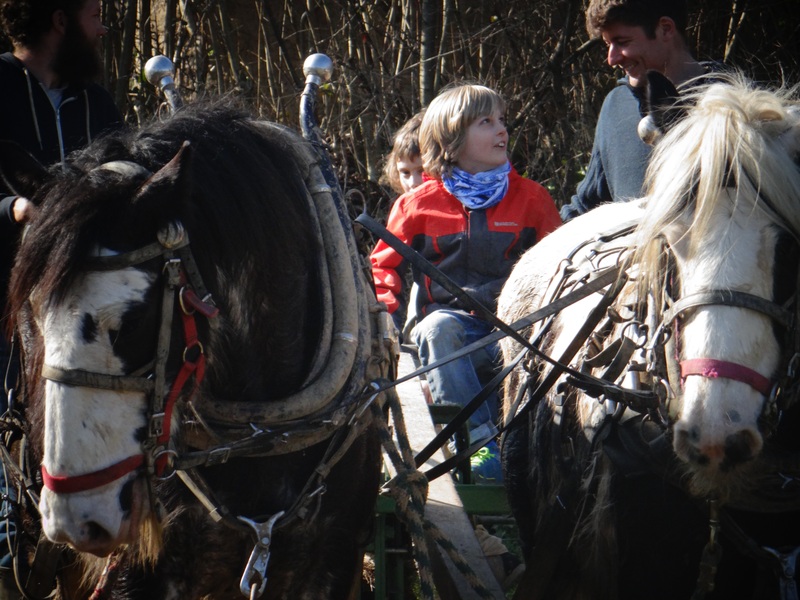 Class 3 students plough the fields with a team of cob horses. Children participating in the outdoor classroom curriculum develop a range of skills as they move through the classes. For the younger classes, the main task is guiding the children’s interests and sense of discovery in the right way, in order for them to develop a sense of wonder for Mother Nature, but also to give them the basis for sciences and later understanding of technical processes. Activities include, wildlife surveys, bird box maintenance, building miniature bug houses, making hazel animals, digging over plants beds, planting and weeding crops, saving seeds, harvesting and pressing apples, cooking over the fire and playing a myriad of nature inspired games. Basic tools are introduced and most lessons are group activities allowing the children to develop their inter-personal skills and enhance their ability to work well together and communicate with their peers. The use of a variety of tools also develops the children’s fine and gross motor skills as well as developing stamina and a work ethic. For the older classes, a more individualistic approach to learning is applied, giving them a sense of ownership and personal achievement. The class 7 allotments are a good example of this, requiring the students to persevere and work on their individual allotments for a full year. By class 8 the challenge is to engage students with a different way of thinking and to broaden their outlook of the school community and the world. This is done by the class carrying out environmental debates and taking on a school community service building project. With all the classes arithmetic’s and numeracy are ever present, be it when counting seeds or apples, measuring the vegetables plots, determining how many plants are needed, spacing the plants evenly weighing charcoal, various building projects, weighing the vegetables ready for selling and of course selling the vegetables and working out prices deals and the weekly income. Literacy is also woven into the curriculum through the use of new terminologies and processes but also through word games and riddles that are carried out with all the classes. The use of poems and stories also enhances the children’s literacy development. 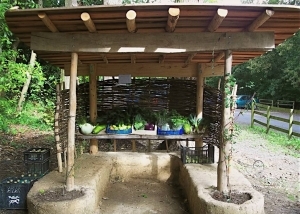 Many of the gardening lessons also provide the content for some of the main lessons carried out back in the classrooms. A good example of this is Class 3’s forestry and building project as well as Class 7’s Lime kiln building, which supports the chemistry main lesson. All of the classes experience a hand’s on approach and will gain a range of practical skills, while at the same time understanding the importance of nature and the role that we as humans have as stewards in making sure that future generations can reap the bountiful rewards mother earth has to offer. “The outdoor environment is outstanding and promotes the pupils’ personal and physical development extremely well. The extensive grounds provide pupils with a rich opportunity for developing an appreciation of horticultural skills and an appreciation of high quality and nutritious foods through well organised activities. Provision for gardening is outstanding. “It’s truly amazing how much the school gardens have developed since I left school in 2000. I have been working in the garden in recent weeks building a stone spiral as part of the new perennial garden project. It was great to be working there, while children of all ages went about their tasks so willingly. It took me back to being around 12 years old and a clear memory of Jack Connabear, who used to farm the land around the school, teaching a few of us stone facing. 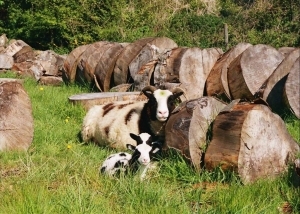 In 1980 Jack had set up the Devon Rural Skills Trust (DRST) to preserve ancient skills such as dry stone walling, stone facing and hedge laying. After school and university I went on to become a trainee with the DRST. Now, here I was back in the school garden teaching one of the DRST’s current trainees, the mother of a girl in class 8! And would you believe it? That very day Class 8 students were rendering the cob tool shed they had built in Class 3. They had made the lime render from quicklime which they made from limestone in a kiln in Class 7. Much of the stone we were using for the wall was limestone and I could hear André discussing the lime cycle with the class as they worked.